iw2394.JPG, originally uploaded by painet. mosaic, originally uploaded by maybemaq. If you are fortunate enough to be able to travel one day along the Silk Road in Central Asia, you will probably get a chance to see this when you reach Uzbekistan. 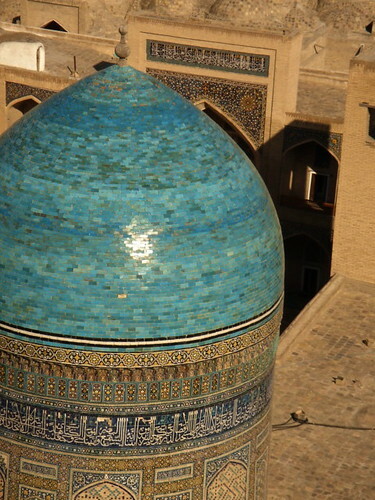 The title Po-i-Kalyan (also Poi Kalyan), which means “The foot of the Great”, belongs to the architectural complex located at the foot of the great minaret Kalyan in Bukhara, Uzbekistan. The Mir-i arab Madrasah mosque is part of this complex. There is little known about the Mir-i Arab Madrasah origin. The construction of Mir-i-Arab Madrasah is ascribed to Sheikh Abdullah Yamani of Yemen, the spiritual mentor of early Shaybanids. He disputably was in charge of donations of Abdullah-khan (1512-1533), devoted to construction of religion edifice.